Jupiter, the King of the Gods, is the ruler of Sagittarius. In Astrology, Jupiter is a planet of plenty. It is tolerant and expansive. The first of the social planets, Jupiter seeks insight through knowledge. Some of this planet’s keywords include morality, gratitude, hope, honor, and the law. Jupiter is a planet of broader purpose, reach, and possibility. Jupiter has generally been associated with good luck and bounty. Optimism and growth (including mental and spiritual growth) come under its rule. On the up side, Jupiter is associated with a sense of humor, good will, and mercy. 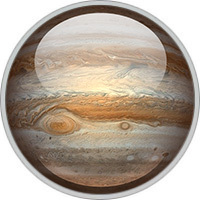 The more negative manifestations of Jupiter include blind optimism, excess, and overindulgence. Irresponsibility that results from blind optimism, not ill will, can be displayed. In the chart, the position of Jupiter by sign reveals how we express our generosity and tolerance. It shows how we go about trusting others and improving our lives. Where do we look for wisdom and understanding? Look to Jupiter’s position by house and to the planets it contacts for answers. Leisure time is also one of Jupiter’s pastimes. Sports of all kinds, games of chance and a stroll in the park with the family pet (Jupiter loves animals) – these are all ruled by this planet. Finally, Jupiter often presages great wealth, material and otherwise. This is a good friend in the heavens!